Pottermore Brings Harry Potter To The Digital World Pottermore, a new website from Harry Potter author J.K. Rowling, will offer digital versions of the books, plus exclusive content from Rowling and a place for fans to post. Author J.K. Rowling poses for photographers as she announces her new website project, Pottermore, at the Victoria and Albert Museum in London. Rowling says she has written new material about the characters, places and objects in the Harry Potter stories that will appear exclusively on the Pottermore site. Starting this fall, for the first time, the Harry Potter novels will be available as e-books. Since the series began its cultural ascent in the late 1990s, its fans — adults, children, and those who have grown up in the 14 years since the first novel was released — have created thousands of fan sites and more than 1 million fan fiction stories. This fall, that content will get an official counterpart. 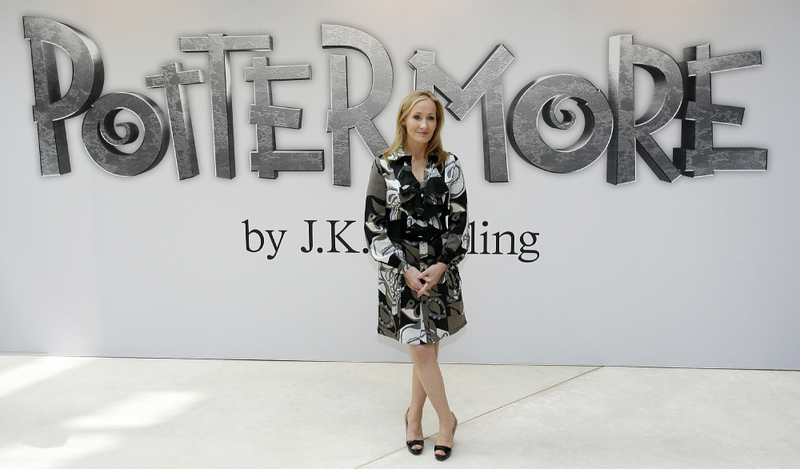 According to an announcement by author J.K. Rowling, a new website called Pottermore, which will launch in October, will be the only place where digital versions of the series will be available. Until now, the novels had been one of the digital publishing world's biggest holdouts. So what does this new website achieve? And why now? Some argue that Rowling and her publishers waited to offer e-books until they got as much as they could out of hardback and paperback sales. But Rod Henwood, CEO of Pottermore, says that it took two years to develop the site, and this is the year that e-books have really come into their own. They also wanted to time the launch to the end of the film series. "Harry might have been perceived as dropping off," Henwood says. Instead, excitement will now build for the site's launch in October. A competition will grant 1 million fans access before it opens to the public (in English, German, Spanish and French versions), and Henwood says the early users will have their own creativity put on display. "We will learn from those users what they like, and what they don't like, and we will adapt and we will evolve the site," he says. According to the creator of one well known fan website, some fans had already been involved with the Pottermore project. But the main thing Pottermore has going for it is Rowling herself. In a promotional video posted to accompany the announcement, the author promises new material. "I will be sharing additional information I have been hoarding about the world of Harry Potter," Rowling says. Henwood says she has already written at least 18,000 words of new material for the site, "which will grow and grow and grow." That "additional information" will include facts about the series' characters, back stories, games, interactive features and a store. The e-books sold on Pottermore will be compatible with major e-readers like Amazon's Kindle, the Sony Reader (the website is partnering with Sony) and the iPad. But the books will only be available from the site itself, not through e-book stores like Amazon. Prices will be announced in October. Along with Sony, Pottermore will feature partnerships with the books' U.S. and U.K. publishers, Scholastic and Bloomsbury. How will it sit with fans? Francesca Coppa, a founding member of the board of the Organization for Tranformative works — an organization of fans that advocate for fan culture — describes the Harry Potter series as this generation's Star Wars, bringing more people into fan culture than ever before. "Writing fan fiction, making art, knitting sweaters, so this whole world of creativity and sharing that is fandom, a whole generation got access to it for the last 10 years through Harry Potter," Coppa says. "There are channels on YouTube devoted to making the recipes — how to make your own butterbeer, how to make chocolate frogs — so all this exists. And to have more, and even if it is J.K. Rowling's Pottermore, that is great. We always want more, and as long as they understand that this is more, that this site will sit within the world of fans that already exists, I think we welcome it." The seven novels have sold more than 450 million copies. Rowling is thinking about a possible encyclopedia. But the serial nature of Harry Potter will end when the final film opens in the U.S. on July 15. When Rowling published a book approximately every year, fans grew up with the series, just like Harry grew up at Hogwarts. With the end of the movies and the books, Rowling and company are clearly trying to re-energize the Harry Potter empire for a digital generation.